Cherrymore is our cherry and plum orchard located in the beautiful Hilltops Region just South from Young, New South Wales. The Batinich Family have owned and run the Cherrymore Orchard for 4 generations.All Cherrymore products are of “Single Origin”, by this we mean all the fruit used in our products come from our own orchard. Young is one of the best growing regions for stone fruit in Australia and is home to the annual National Cherry Festival. 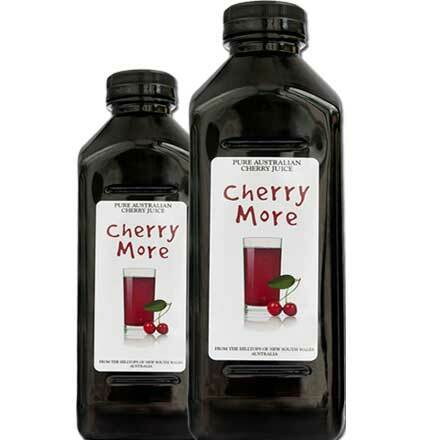 Cherrymore is 100% pure juice from Australian-grown cherries and does not contain any concentrate or other additives. Our fresh cherries are picked in December every year, fresh crushed and bottled within 3 days of picking. Once bottled it will store in the pantry with your other long life drinks. More than a kilo of antioxidant-rich, hand-selected Australian cherries in every litre. Cherries are a rich source of antioxidants including anthocyanins and quercetin. Cherry juice is also packed with C and B complex vitamins, and the minerals calcium and potassium. For the past year I have been having the cherry juice every morning , nice and cold and its very pleasant to the taste buds . I read all about the benefits of this juice and decided to give it a go . I can say that I have found that I don’t ache as much in my joints anymore and that it seems to give me that little bit of a boost that I need now . I highly recommend this juice . I had long read the benefits of cherry juice and when I noticed a bottle in my local greengrocer, I thought I would give it a try. That was nearly a year ago, and I haven’t looked back. Joints that were a bit stiff no longer give me any grief. I seem to be full of energy, blood pressure is always perfect.